AOLA very long CVS receipt. It's not uncommon for retailers to append a coupon or two to the end of their receipts in an attempt to get repeat business. But CVS is taking the practice to ridiculous new lengths. A coworker here at AOL recently visited a local CVS to get a single item -- a container of sanitizing wipes -- and received a receipt that we measured at 38 inches. That length was due to the six coupons attached to the end of the receipt, which he got thanks to his membership in the ExtraCare rewards program. By contrast, a one-item purchase I made at CVS without the benefit of membership produced a receipt less than six inches long. Apparently this isn't an isolated incident. Various people have taken to Twitter to puzzle over the enormous receipts that CVS insists on handing to customers. 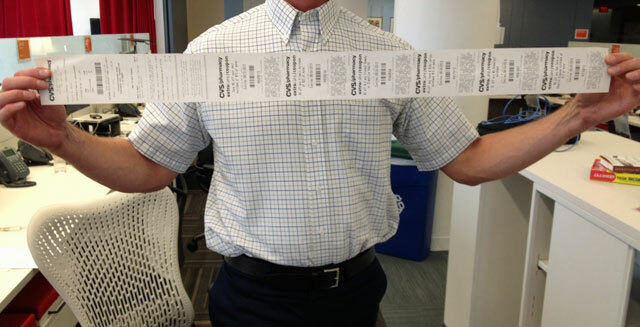 I just built the world's largest suspension bridge with my CVS receipt. Multiple users on Twitter and Facebook have complained that the long receipts are environmentally unfriendly. Not so, says the company in a response to a customer on its Facebook page. "Printing coupons on receipts helps us cut back on the amount of paper needed to print coupons on paper or send direct mail offers," it wrote. "Also, our Send to Card option allows many coupons & ExtraBucks Rewards to be sent to your ExtraCare card digitally." In a statement, a CVS Caremark (CVS) spokeswoman elaborated a bit on this point, explaining that "Printing our coupons and rewards on the register receipts uses less paper than printing coupons on additional paper or that would be required if we sent direct mail offers to our members." Still, if the goal was to save paper, we think CVS could have come up with a better solution than printing out yard-long receipts (for instance, by making "Send to Card" the default option). In any case, the company does seem to realize that consumers aren't crazy about the giant receipts. While it defends them by noting that redemption of ExtraCare is at an all-time high, it adds, "We truly appreciate all customer feedback and are currently working on additional ways to reduce the length of the receipt for customers that do not want to physically print their coupons in 2014." In the meantime, we're sure you can find some creative ways to use your receipt. Pro-tip: If you buy toilet paper from CVS, the long receipt you get is like getting a whole extra roll for free.